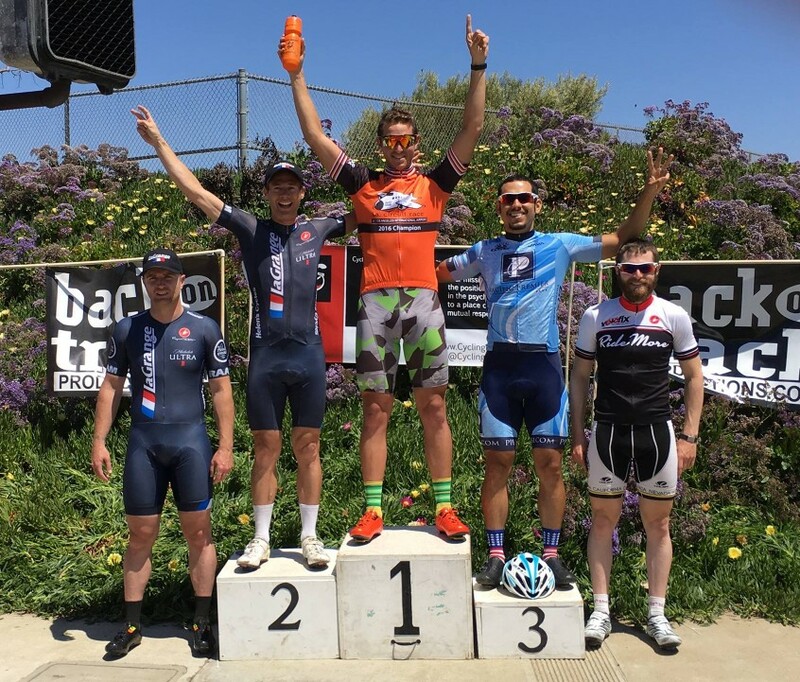 They say that April showers bring May flowers, and whether or not you are seeing flowers today, the April showers did in fact turn up last month, raining out our first event of the 2016 La Grange Cup, the 500M at the Encino Velodrome. But we've rescheduled for this Saturday, May 7th, from 12pm-3pm. Each and every one of you is invited to participate. So please sign up and join us! It's totally FREE, there are prizes, including custom jerseys for the winners of each age category, and no license or prior experience is required. And as if there were not enough, we are very happy to report that our valued sponsor Gerry Agnew aka CalBikeLaw.com will be providing a Taco Guy on the velodrome's infield! So come ride your bike for 500 meters, burn approximately 80 calories and then replenish your energy stores with 800 calories of tacos! Everyone is a winner when tacos are involved! Thank you CalBikeLaw! Come out, pedal your bicycle 0.31 miles with 0 ft of climbing, and delicious tacos will await as your reward. Our sponsor AgnewBrusavich / CalBikeLaw.com isn't just providing tacos for the La Grange Cup 500M, but is also pleased to announce the beginning of its 2016 scholarship application period. As part of the firm’s ongoing support of numerous Southern California cycling clubs, including South Bay Wheelmen, Ironfly Cycling Team, Peninsula Cycle Club, Pasadena Athletic Association, Velo Club La Grange, the Bahati Foundation, Beach Cities Cycling Club and BIG Picture Cycling, AgnewBrusavich seeks scholarship applications from qualified high school students associated with these clubs who plan to attend community college this fall. AgnewBrusavich has annually awarded scholarships for the past 22 years, and has awarded over 540 scholarships to eligible and qualified students. Applications are due on May 27, 2016. You can download the application here. This is a great program and we have had La Grange high schoolers win in past years - please spread the word! Upcoming Events May 2016 / National Bike Month! Last year I created an interactive map locating all water points (fountains, outlets and restrooms…) known in the Santa Monica Mountains. Here is the 2016 updated version! With the summer coming up, we’ll ride more and more in those hills and we’ll need to refill those water bottles before it’s too late and we get dehydrated! Just go to https://www.zeemaps.com/Water_points_in_the_Santa_Monica_Mountains to find the exact location of more than 35 water fountains you wish you knew existed! Please contribute if you know of a water outlet that is still missing and add the appropriate marker to the map. You can also spread the word and share the map to all of your cycling friends. And remember, treat the water fountains and the area surrounding them with respect (no degradation, littering, etc). Enjoy! 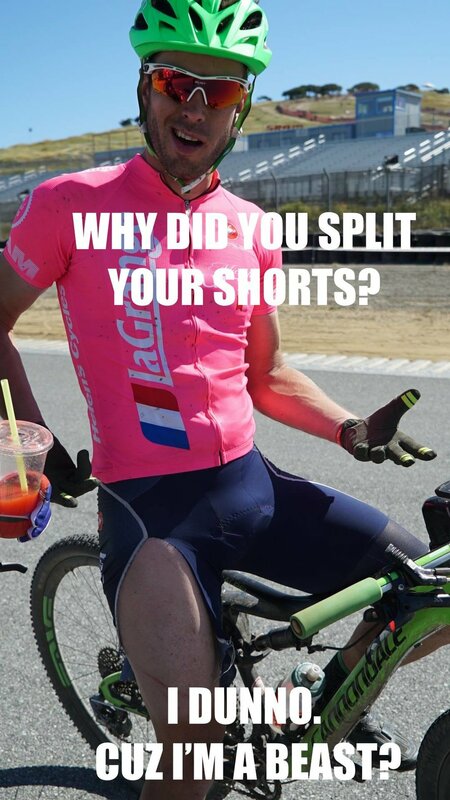 Contrary to my 2014 Sea Otter excursion with David Miller, this trip only had me signed up for 2 races instead of 5. Rolled in Wednesday night and instead of camping in the rain I called my friend Colleen up and stayed at her AirBnB. Bonus, Rebecca Rusch was there and I got to see her amazing passion for her women's advocacy and bike racing mixed together as she and her team planned for the Sea Otter festival events. Really inspiring. Thursday I set up camp with the LaGrange tent. And then the Big Orange crew showed up with their tent. And everything balanced out. Cast iron cookouts over open fire were the norm over beautiful country side! Friday I drove up to Santa Cruz to ride the new and now world famous Flow Trail in the Demo Forest. I was so gleefully happy you could probably see my excitement in my bib shorts. Phenomenal. And then Chris Rovin showed up with his lady and all was good with LG. Saturday was expo time! All the vendors. All the toys. All the deals. Oh and then Sean Burkitt raced cross and I heckled the hell out of him. Also some great Dual Slalom racing took place and was fun to watch. At some point I saw Eric Bryan. Sunday was the main event: the XC mountain bike race, the race that put Sea Otter on the map. This was the course that I had the best chance of having a good race at and I'm very happy with my legs. The fields become stacked with racers from across the country. I was just happy to have 20 riders on the starting line in comparison with the dismal Kenda Cup turnouts for my age group. I made the right selection from the start after the fast start and downhill and got a pace line on the jeep road dropping a big portion of the field. While climbing a twisty piece of single track, I brushed a shrub and my ripped my brand new LG bib shorts! I was distracted and started losing my group of 5 riders as I kept tugging to keep my goods from spilling out or chaffing bad. Unfortunately, I lost this group in this mishap. I motor'd along and then the organizers decided to throw in a 3 minute hike-a-bike uphill section that threw me off and got passed by 6 more riders as they were much better runners than I am. But from then on out it was balls out racing. Felt great. Like REALLY great. Motor'd motor'd motor'd and finally got back to Laguna Seca race track and bombed down into the finish. The announcers said "Patrick Barrett's had a wardrobe malfunction!" as I came through. Still not a great finish for me but I'm starting to see progress on a favorable course. Oh and then I rode an eMTB for 2 hours giggling like a little 12 year old that just got his first 10 speed. Do I hope it catches on? No. Do I think it helps trail advocacy? No. Do I think it's good for the sport? No. Is it exactly what I wanted to do after 2 hours of XC racing? Absolutely yes. First, off I would like to say that LAX Circuit race was a blast! Second, I had a great time with all the lovely people in the La Grange tent and my great teammates! So I started off the race without much of a warm up. My dad and I arrived about 15 minutes before the start and I needed to get registered and be pinned. After all of the chaos of getting ready I hopped on the bike and did a lap with Danielle and Susan. After that we cruised over to the start for staging and next thing I knew the race was off! As you can imagine that lovely remark was then preceded by the whole women’s field going off on the old man. Now flash forward to ½ a lap to go. The pace has picked up, and I’m on the second fastest wheel getting pulled to the front so that she (the wheel) could get a good position. 200 meters out and the sprint had finally commenced. I had five girls in front of me (soon to be two) barreling toward the finish line and I hadn’t even begun my sprint yet. With a 150 meters to go I pulled away from the wheel I was drafting off of, put my head down, and just went for it with all my power. I kept expecting for someone to pop up and laugh at me as they pedaled with ease right by, but I ended up crossing the finish line bike lengths in front of everyone else. Thinking back I realize that without Danielle and Susan there to monitor the pace out in front I would have never won that race. Also having an amazing La Grange Cannondale CAAD 10 didn’t hurt. Overall it was a pretty good race. Having ridden NPR (LAX course) in excess of 100 times in the last 2 years I felt confident I knew the course. When I crashed making a u-turn at NPR just 5 days before the race I started reminding myself that I really have no idea how to race. My only talent is riding away from stop lights quickly trying to make the next light before the peloton. On race day I rode over with Todd Shoenbaum, our new Cat 3 / NPR / track sprinter who wins NPR pretty much all the time. Todd asked me what my strategy was as we warmed up. I replied that I had no plan, just that sometimes I have a switch that flips and when it flips I go with it, no matter what. Todd looked at me like I was a complete idiot. We lined up for the 2016 LAX Circuit Race; Cat 3, probably the most important race of the day. Cat 3s are the kind who have raced way too many days to get here, but need just a few podiums to get out. For the talented it's a brief pit-stop on their way to stardom. For the rest of us it's life. As you look around the start line you try to ascertain who is looking for the upgrade and those who are here to have fun (race). So off we went, eight 4-mile laps ahead of us with a slight cross-breeze. Should be easy. I sat in for the first lap, as did everybody else. Nothing to see here. As we made the 1.5 lap turn to head west the wind picked up. Seven of us pulled away from the group and formed the first break of the day. Unfortunately, the Seth Davidson law of breaks: "Never be the strongest guy in the break", was in complete violation. I found myself doing most of the work, and a few weren't even pretending to be in the rotation. We were caught a lap later by 2 strong riders, who blew past us. I briefly latched on, but noticed the peloton bearing down on us so decided to preserve my energy. Half a lap later as we turned west-bound and into the now brutal wind that only Major Motion regulars can talk to after pitchers at the Shack, one of the "strong guys" who had bridged up attacked. I happened to slip onto his wheel, and off we went. I'm not sure if he noticed me hiding in his wings, but there I was, latched on to this strong wheel. As we came by the Start / Finish with a nice break, a really nice break, I saw the 4-lap sign. What! 16 miles to go, with no traffic lights to help! Oh boy. We rotated as best we could but I was definitely not the Strongest Guy in the Break. Hearing "Go Cowan" as we passed the spectators really gave me a boost; thank you, each of you made a difference. With 1.5 laps to go I started to believe that we might actually have a chance, even though there were at least 20 sprinters waiting like vultures just mere seconds behind our increasingly tiring legs. I gave it a few kicks and we picked up the pace. We made the turn to head east, now with just 1.25 laps to go, finally a tailwind. We picked it up to 30+. As we passed the peloton I caught a direct look from former BGP State Champion Marco "The Breeze" Fabrizio. Marco told me in that split second that if I wanted to be on the podium, today was my day. He was on the front controlling the sprinters and upgraders - he was helping my break stick. It felt so damn good. That was it. Teamwork set it off and gave me the confidence that the two of us could do this. We rotated, drilled, buried, gasped, but most of all, we worked together. Just 4 miles later, with no sign of the peloton catching us we lined up for the finish. I did what I do best and led the strong guy out, making sure he got what he deserved. An upgrade. See ya later! Now can we just have fun (race)? Todd, our sprinter, got 2nd in the field sprint, so I feel a bit guilty that I took his spot, as he was the one who actually had a plan. Thanks to all the LGers who were ready to attack if my break failed: Thomas, Jaycee, Marco and Todd. This was my first race of the season so I told myself beforehand that I was going to take a conservative approach where I would avoid making unnecessary hard efforts and save my energy for the sprint. However, after the first lap I found myself attempting a breakaway with another rider. Keep in mind I said, “attempting.” We were caught by the peloton only after a few rotations. For the most part, the race went relatively smooth with the exception of a guy going down in the second turnaround during the middle of the race. It was actually quite impressive though. As his body hit the pavement, he sprang back up and was back in the saddle within seconds although the speed at which he got going disrupted everyone else’s momentum. As mentioned, I didn’t have much of a plan in this race other than to keep a low profile and, as a team, we didn’t really have a plan either. But during the last lap, Johnny called me out and told me to grab his wheel at the first turnaround so we could make our way up. I failed. As we made the turn, Johnny was on the inside and I was unable to make my way towards him and ultimately remained by myself on the outside of the peloton. As we approached the last turnaround I kept falling back as everyone on the inside progressed forward. At this moment, I realized I was in the middle of the pack and was not going to have a good finish unless I made a big effort to get to the front. So I made a hard charge on the outside, took a wide turn on the last turnaround and continued to pull my way up until I was able to squeeze in behind a wheel towards the front of the group. After soft peddling and catching my breath for a few moments it was time to sprint. I finished 5th. First off, no matter how in shape you think you are, doing two 60 min crits in a row is not recommended. Especially when the first of those crits is the Men’s A collegiate championships, and even more especially when the day before was the championship road race with crazy winds and 40mph sprint finishes. With that out of the way, I rolled up for the Men’s 3 crit in Santa Barbara having had 30 min of rest since the previous finish. La Grange had the most players in the game, but Todd was the only fresh one, since Jasper, Alex and I had all just finished the A’s race earlier. Still, with a field of only 13 riders, it didn’t take long for an attack to stick. 5 minutes in, 3 of us were away: myself, a Fig Mt. rider, and a junior rider from Echelon. I had raced with the junior before, and the Fig Mt. rider was taking some strong pulls, so I was confident we were away, especially with only a small number willing to chase in the field. So we settled into a rhythm, and 20 min later, we were back in the field. Now, this should have been the ideal circumstance for me, with the largest team in the field. And that’s how I rode the rest of the race. Nearing the end of the race, Jasper and Alex formed up to help lead me out, which in normal circumstances should have practically guaranteed me the win. But alas, the fatigue of 2 hours of crit racing had caught up to us, and Alex and Jasper weren’t able to keep the pace high enough to keep the Fig Mt. rider at bay. He attacked wide and early, forcing me to abandon my lead out and chase. With my legs exhausted as it was, there was no closing the gap, and even worse, because I had gone so early to chase, the Echelon rider was able to come around me just at the end, leaving me as the last of the break, in 3rd. Even so, a podium is a podium, and I’m proud of the solid teamwork from La Grange that kept the race competitive to the end. This years ride was billed as the hardest and longest edition yet. The organizers did not exaggerate. With 146 miles total distance and18 dirt sections totalling 40 miles it was a mixed road suffer fast of epic scale. Oh, and did I mention the nearly 12 thousand feet of climbing? Likely more as my Garmin tends to under read elevation gain. My training mate Nigel and I had already decided that we would focus on just finishing this tour of North County San Diego, but as always happens when the starting signal goes and the Peloton takes off you go with the other lemmings and start to hammer. The first road section was done at Heart Rate Zone 4+ which is threshold for me, (I set my info page to Elapsed time, speed and Heart Rate Zone, since I did not want to be constantly reminded of how far we had to go). When we hit the first dirt section I backed off a little, the first section started easy, but the second section was a full frontal attack of winding technical single track, short punchy rock climbs and small sand traps. Attrition started to take it's toll as riders wiped out. Once out of that section the next road section settled down nicely until we got to the Felicitas park rock gardens. There I took a nasty fall as I misjudged my line. Took some rocky road rash to my legs and cactus needles in my shoulder, I think some are still there as I write this! But, worst of all, I lost my salami and Pita bread sammies! Anyway, we got to the next SAG stop, one person pulled out a needle that was at least an inch long from my shoulder. Quick recovery and we were off for some nice flowing sandy gravel single track. We made up some good time there and then exited into the hard climb of the Arendberg. This led into a short descent into Ramona and then the dirt climb to the Sutherland Dam (Damberg). Back to the treacherous Sandy Bandy which I almost made through only to be pitched off the bike at the very end! Much cursing and swearing ensued. From there it was back along the mule, the Meer Hodgesgate (where I took the ubiquitous bike/water shot). Then a long haul back to the first dirt section in reverse with some changes in direction. This section, Saint Lusardi Omgekeerde, was just plain stupid. One could hardly do the climbs on a mountain bike let alone a road bike (although I am sure the top guys did). At this point we were 120 miles in with 26 to go including some of the hardest climbing. We both turned it way down to zone three, and thankful for a cheese burger donation made our way to the Double park climb (Dubbelberg) via several other nasty little punches to the throat, including the Canyon Del Oro, Elfinberg Bos and Muur Van Dubbelberg. After that it was all down hill for the last four miles. Elapsed time was 11 hours 32 minutes. Moving time was just over an hour less. The longest I have ever been on a bike. In summary, this was a full day of the most brutal beatdown sufferfest I have ever subjected myself to. Um yeah…this race didn’t work out as planned. Just when I thought there was going to be a smooth CBR, there was a crash right in front of me as we were making the climb up “Mount Carson” with two laps to go. Fortunately I managed to avoid going down but I nearly came to a dead stop in an effort to avoid the carnage (apparently one of the guys who went down broke his collarbone). Although I was able to catch the peloton after the crash I couldn’t get good positioning and ultimately finished 23rd. I will be back. It was not even 11 o’clock. I was feeling some distress after the second King of the Mountain climb of the day, and this ride was only two-thirds done. Having just fixed the second of what would be my four front flat tires, I was in the largest group I would see that day, so to make conversation, I asked rhetorically of no one in particular, “Why did we think this was a good idea, again?” Usually on a “fun ride” like this, someone will reply back, “I know, right?” But not at the Belgian Waffle Ride. The only response was vacant stares from sunken eyes, and gasping from dry mouths. This was misery, and I was in company. It was going to be a long day. Suffice it to say that there’s a lot of extreme hype and myth-making leading up to the BWR. I’ll simply describe my inside experience as your ordinary La Granger. What is the Belgian Waffle Ride like? The course is like an all-day buffet with a menu of asphalt, dirt, rocks and “sand,” which is really more like silt that swallows wheels and magnetically pulls bodies to earth. After one course at this banquet, you may seat yourself at a table with some other sullen riders feasting on their own pain and sorrow, or you may just be eating by yourself for a while. Besides the course itself, one of the big challenges of the day is keeping the event in perspective. It’s not a world championship, it’s not even a USAC race, but it has to be challenging for everyone there. I call it Middle Age Silliness, because there’s seemingly not a lot of participants who don’t qualify as Masters. I’ll fast-forward through the on-road, off-road, climbing, sand and gravel, which is just as tricky and fun as you may imagine, and fast-forward to the elephant in the banquet hall, Double Peak, a 1km climb of up to 23% steepness just 7 miles before the end of the ride. Having that monument awaiting at the end of the ride serves at least a couple of functions: one, it encouraged me at least to keep my powder dry and save something of myself for the end, and two, it helps make the BWR a more universal and relatable experience. Whatever fear factor a given rider has, be it Mandeville, double-Latigo or maybe even delivering a public speech, conquering the fear by actually hunkering down and doing it can be its own reward, regardless of time or standings. The ride may not be the Somme battlefield that the organizers foreshadow. But at the finish, with the tough guys and girls eating their sweet waffles with ice cream and chocolate sauce, there was a heaping ton of modesty, and none of it false. To be really authentic, you can’t give yourself a nickname, or call yourself “badass.” But you can certainly have someone else call you “badass,” and that happens all over the Belgian Waffle Ride, right down to the Badass Ale handed to every finisher. The irresistible draw of this ride is the opportunity to be called badass, which is all the more rewarding after being totally humbled. Can that ever happen often enough? I’ll gladly be called badass, and the Badass Ale bottles I’ve collected just may be my childrens’ inheritance. Todd Schoenbaum, David Miller and Track Captain Kate Wymbs at LAVRA Friday Night Racing at the velodrome in Carson. Casper and Marco at the BWR. #ambassadors. 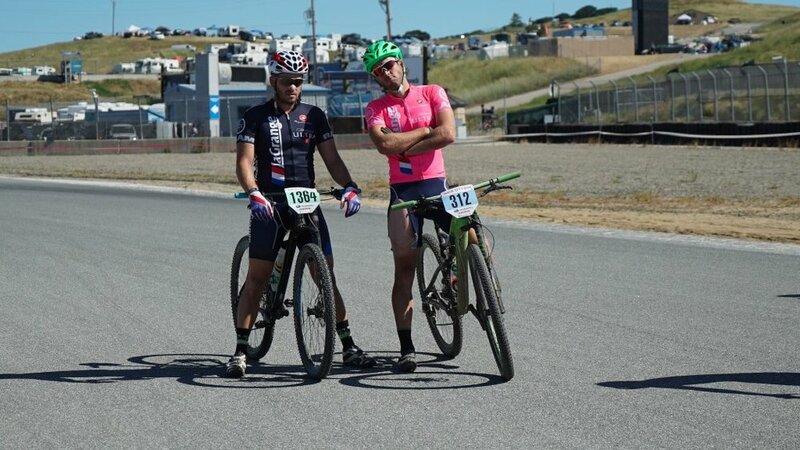 Chris Rovin and Patrick Barrett at the Sea Otter Classic. Ivy Koester demonstrates the tough training required to be a top track racer. Jackson Brock, Will Hughes and Stuart Brogan sporting three generations of La Grange kit at LAVRA Friday Night Racing at the velodrome in Carson. Guillermo Roman, Jaycee Cary, Stuart Brogan, Palle Jensen and Stephen Kennelly living the #ultralife at LA Circuit Race. Patrick Barrett on the podium at the US Cup mountain bike race at Bonelli Park. For most riders, there is a fairly good roadmap for what to do when you get hit, and by now we all know that it’s usually a very good idea to call a lawyer. But what about when you don’t get hit? What about those times when the driver tries to hit you but fails, otherwise known as “buzzing”? Is there anything you can do about it? The short answer is “yes,” but it’s not easy. Sometimes you’re really angry and then the anger recedes and you feel lucky to have survived. But other times the anger doesn’t go away, or you’re reminded of the rider who took the time to file a complaint against the infamous Dr. Thompson. Dr. Thompson intentionally hit Ron Peterson while descending Mandeville, and the doc got jail time because of the prior report. In other words, when the violation is egregious enough, it really does make sense – sometimes – to not simply roll over and get on with your life. What follows is a rough re-wording of a very excellent email I received from a cop who’s been in law enforcement for over twenty years, and it’s well worth filing this away if you ever find yourself the victim of some jerk who thinks that your life is as disposable as a candy wrapper. The first question you have to ask yourself regarding any buzzing incident is this: Was the act of "buzzing" intentional? This is key because with few exceptions only intentional acts are crimes. Based on many descriptions of such events, not to mention my own close shaves with cager crazies, it is often clear that the answer is "yes, the action was intentional." But you have to be sure of that on your own, and it’s extremely beneficial to have witnesses or video. Once you’ve concluded that the driver intentionally tried to hit you, go to the police station whose jurisdiction includes the location of the incident and file a report. 2. Go there in person. 4. Be prepared for them to do everything in their power NOT to file a report. If you’re at the station, you have decided that you want to involve the police. It’s not easy and it’s a hassle; despite constantly telling people to contact the police, few do. But ask yourself this: How are you going to feel if you read an article a week from now that a cyclist was mowed down by the same driver who buzzed you? If you believe that society is only safe when we look out for each other, then you have a duty to do this. Once you have decided to do this, don’t waver. Do, however, be nice. And most of all don't try to cut any slack for this unknown driver who almost killed you. Stop feeling like a bad person because you are calling out someone else's conduct, and don’t feel bad about the negative consequences that will occur to the driver of the car. The driver was a big enough boy or girl to try and kill you, now he or she will be big enough to deal with the fallout. If you begin to waver, the police will immediately detect this and do everything they can to avoid taking a police report. Face them firmly, politely, and with the same calm resolution that you’d defend your spouse or child. If you have to, hum a few lines to yourself of “I Won’t Back Down” by Tom Petty. So now you’re in the station and you have to demand a report. Not ask for one. Not suggest they write one. Not beg for one. You have to demand it. And you have to demand it politely and without hesitation. Do not leave the station without what is called a DR number for the report. Statements by the police such as, "We will keep an eye out for the guy," or "I will give you an incident number" are unacceptable. You’ve gone to this much trouble to get a DR number and you owe it to yourself and everyone else not to leave without one. *Important note: The term “DR number” is a term specific to the Los Angeles Police Department. The LA Sheriff’s Department calls the same number a “URN number.” Other police agencies call them varying things. What you need to do is get assurance that the officer handling your complaint is going to provide you with a police report and you should probably get the name of a detective or detective supervisor who is going to follow up on the police report. When you demand the DR number, it’s practically guaranteed that you will be told one of several things, all well-practiced moves by the police to send you home and keep them from having to do their job. #1. “Why didn't you report the crime at the time it occurred?” Your answer should immediately be, "Can I speak to your watch commander? I won’t allow you to blame me, the victim of a crime, for my conduct, when it is clear that a crime occurred." Do not engage any further with a police officer who asks you questions like this. It is inappropriate. When you do speak with the watch commander, make sure you tell the boss about the conduct. And remember, you’re in a police station. Any escalation of tone or hint of violence or threats on your part will wreck your endeavor. #2. “This is not an assault with a deadly weapon, you need to report this to the Traffic Division as it is a traffic matter.” Your answer should immediately be, "Can I speak to your watch commander? You are incorrect, but I do not want to argue with you about the law." Do not engage any further with a police officer that asks you questions like this. It is inappropriate. It is also abundantly clear that he does not know the law. When you do speak with the watch commander, make sure you tell him about the conduct. Direct the watch commander to the following case: People v. Wright, 100 Cal.App.4th 703. If the watch commander doesn't understand what that is, you are going to have to insist on talking with his boss. If all of that fails, call me. I’ll go with you to the station and we can jointly explain the basics of PC245(a)(1) as interpreted by People v. Wright, 100 Cal.App.4th 703. We’ll get the DR number and we’ll get the wheels of justice turning.